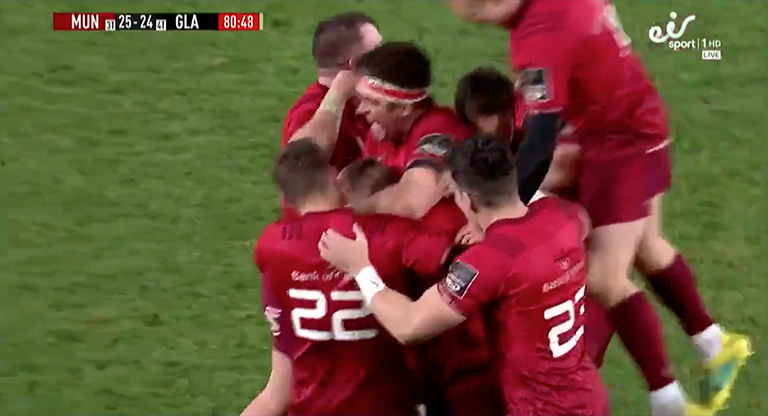 Munster completed an incredible fight back in the final moments to claim unlikely victory over Glasgow Warriors in Thomond Park this evening, thanks to the boot of Rory Scannell. The southern province were trailing 24-10 with less than twenty minutes to go, facing certain defeat. But the men in red simply wouldn’t give up and fought back with tries through Alex Wootton (66) and Alby Mathewson (73) to get within two points. They were then given a chance to win the game as the clock went red after winning a penalty thanks to some excellent pressure at the breakdown. Up then stepped Rory Scannell from just inside Glasgow’s half to claim a famous victory. Sensational.